Urban subjects killings by the security forces to a great deal of scrutiny. Starting with the arrival of the SAS in the 1970s, through the RUC 'shoot to kill' episodes of the early 1980s, which led to the Stalker Affair, to the Loughall ambush which killed eight IRA members in 1987. Loughgall was the clearest example of the philosophy of the 'clean kill', in which the security forces attempted to use intelligence to ambush IRA members in action. Urban is clear that the 'clean kill' was as much about appearance as reality, and that the courts were often misled about the true circumstances of killings. While Urban acknowledges the moral dilemmas inherent in running agents within paramilitary groups, in this book he concludes that there is no evidence that the security forces deliberately colluded with loyalist death squads. He provides an extensive critique of allegations to this effect by former British Army officers Colin Wallace and Fred Holroyd. It may be significant that one of Urban's criticisms concerns Holroyd's characterisation of 14 Int/SRU as an SAS unit. 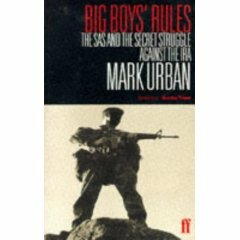 Recently released files show that there was indeed extensive SAS involvement in the SRU in the mid-1970s which the state was anxious to conceal. Since the publication of this book, Urban has himself reported on the Pat Finucane case and the Stevens Inquiry's finding that the security forces were involved in collusion with loyalists. He would, therefore, presumably accept that this book's judgments are outdated on this question. Indeed, I would not be surprised to learn that later editions than my copy (1992) address this. One cannot help feeling that some of Urban's sources in the security forces may have been involved in something of a 'limited hangout.' Nevertheless, Big Boys Rules remains an extremely valuable book.